Most of the Google Chrome keyboard shortcuts will work with Chrome OS too. However, let us explore some Chrome OS-specific keyboard shortcuts first. First up, a handful of keyboard shortcuts that every Chrome OS user must know. Capslock key is one of the first things that users look for when they start using a Chromebook. The Keyboard on Chromebooks and other Chrome OS devices, the Search key replaces Capslock. However, for those who really need Capslock, there is a keyboard shortcut. Just like the dedicated capslock key, there are no Home, End or Delete keys on Chromebook keyboards. But there are alternatives. Here is a handy list. For Delete key, press ALT + Backspace. You can use the same keyboard shortcut for deleting files from the file manager and Google Drive. You can hold the power button for a second or two to lock the Chromebook’s screen. However, if you are a keyboard shortcut lover, or missing one of your most used Windows keyboard shortcuts, press SEARCH +L. Okay, you now know how to lock the screen. But what is the keyboard shortcut to log out of your Chromebook? Ctrl + Shift + Q it is! There is no PrtScn key on a Chromebook. You can easily take screenshots using a keyboard combination. One of the most used keyboard shortcuts for me, second only to the Screenshot one (I take a lot of screenshots for my blog) Press ALT + Shift + M to open the file manager of your Chromebook. While you are in the Files app, or the File Manager, Ctrl + E creates a new folder. Since Google Drive is integrated with the Files app, this keyboard shortcut can be used to create new folders in the Google Drive section of the app. The Chrome OS team has added a good looking help app that works offline. To access this, press Ctrl + ? Chrome OS used to have a useful keyboard overlay to help us learn keyboard shortcuts. This has been replaced with a keyboard shortcuts app. Once you have it open, you can right-click the app icon from the shelf and pin it. 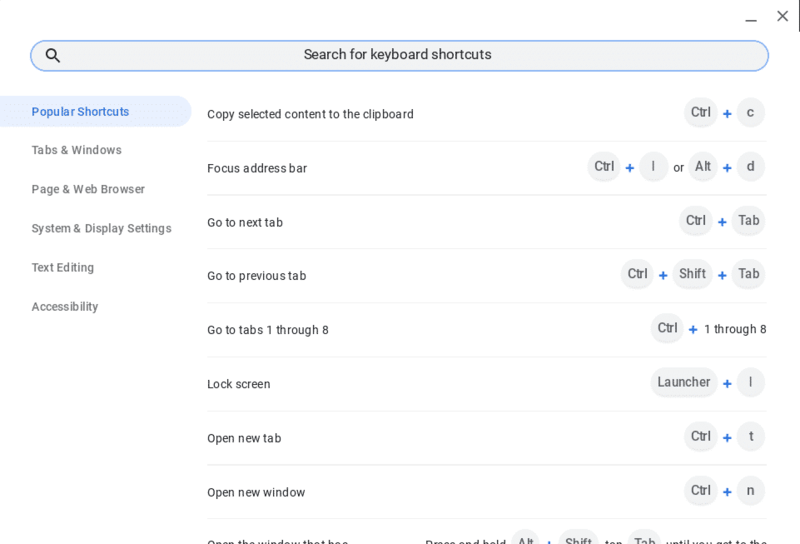 How do I modify keyboard shortcuts in Chrome OS? Well, there is a way to do that! Now let us take a look at these in detail. As I explained the Keyboard section of the Chrome OS Settings guide, you can remap Alt, Ctrl, Search and even the Assistant key. Open Chrome OS Settings app and go to Device > Keyboard. By default, the keys are assigned to their namesake. For example, CTRL key on the keyboard will do what CTRL does. From the drop-down menu against each key, select the new action that you want to assign. For example, select Caps lock from the drop-down against Ctrl to make CTRL key work as Caps lock. 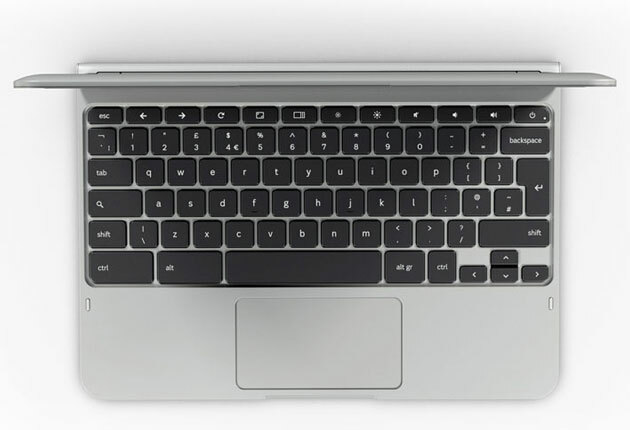 Chromebooks (famously) come with a set of Chrome OS specific keys in the first row of the keyboard, instead of the traditional function keys (F1, F2 F3 etc). That is to make the top row work as function keys, always. What if you want those keys to work as function keys only temporarily? Simply press and hold down the Search aka Launcher key and tap any of those top row keys to use them as function keys!. For example, hold down the Search key and press the reload key to use it as F2.